Empire Entertainment & Matrix Magic Shows are please introduce " BRETSKY " - Master Magician. Bret Beaudry is a native of Michigan and has performed professional magic for over three decades. He has appeared in the movie "Magic Town" and on television with Soupy Sales, Milton Berle, Bozo the Clown, Scatman Crothers, Larry Thompson, Cam Carmen and many news casts. He continues to mystify audiences of all ages and sizes performing at fairs, festivals, conventions, trade shows, scouts, hotels, churches and corporate events. Beaudry strives for perfection and has a documented 99.7% "QUALITY OF SHOW" customer satisfaction rating. 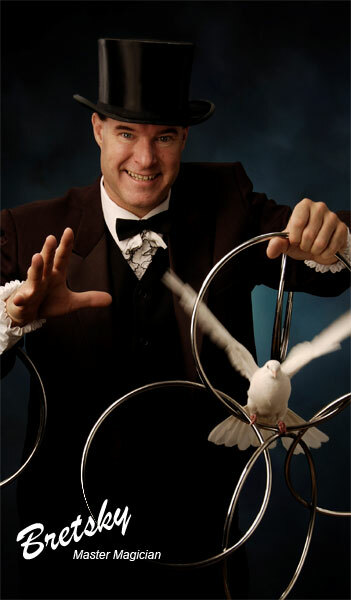 From close-up strolling magic to floor shows to full blown illusion stage shows, " BRETSKY IS MAGIC"! See more info here www.empiremagic.info.